Tullian Tchividjian remembers the Sunday morning he woke up hung over, still dressed in the clothes he'd worn until passing out during a night of partying. After five-years of hard living, Tullian had come to the end of himself. He got up and went down the street to church. What he found there shocked him--a community of Christians who joyfully and radically lived out the Gospel in ways he’d never seen before. The encounter showed him a new way of living in the world–and he came to personal faith in Christ. // Tullian's experience convinced him that young Christians today don’t want a faith community that tries to come off as appealing and trendy. Christ followers are called to embrace a standard that’s “out of this world.” Why? Because the only way to make a difference in the world is by being different. 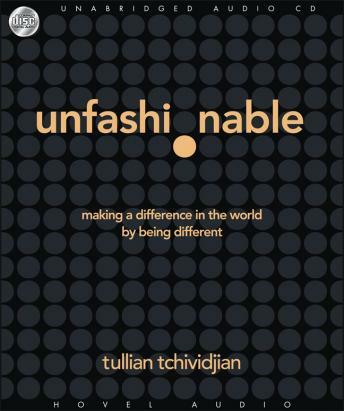 // To help his listeners re-imagine a radically “unfashionable” lifestyle, Tullian examines what Gospel-infused priorities would look like in relationships, community, work, finances and culture. Listeners will come away with a clear picture of what it means to live subversively–and redemptively–for God.